Samsung is said to be planning its own Apple-like retail push across the U.S., as the company recently hired an ex-Apple senior store designer, according to a new report. Installation showing a sample Samsung Experience Shop at Best Buy. Courtesy of Samsung. The alleged hiring of Tim Gudgel from Apple to Samsung's U.S. telecom unit is part of a "deeper investment in U.S. retail," two sources reportedly told Katie Benner and Jessica E. Lessin of The Information. Gudget is said to specialize in store design and planning, and previously worked for Gehry Partners. Gudgel's public LinkedIn profile makes no mention of Samsung, but it does mention his previous employment with Apple. The architecture and planning expert is a graduate of Washington State University. 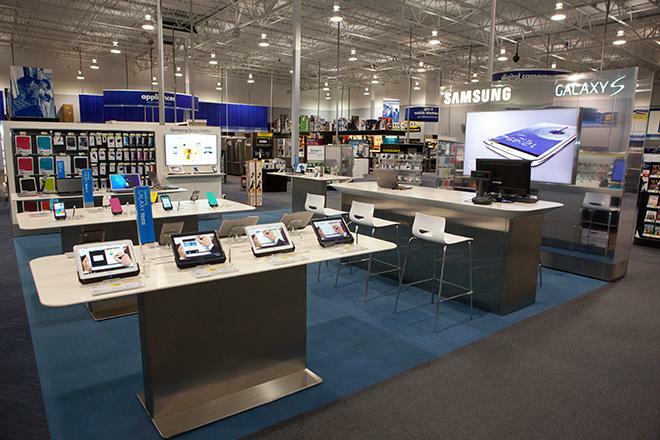 Samsung's existing retail plans involve nearly 1,500 mini-stores at Best Buy locations throughout America. Dubbed "Samsung Experience Shops," the designated floor space is similar to Apple's own mini-stores that have been found in Best Buy locations for years. Samsung's apparent interest in entering the retail game brings it in the footsteps of another key Apple rival, Microsoft, which began opening its own stores to push hardware and software from the Redmond, Wash., company in 2009. Microsoft's own strategy has borrowed heavily from Apple, giving the stores a similar look and even choosing to be located in close proximity —often the same mall —as an existing Apple Store. Though it does not have its own shops yet in the U.S., Samsung does have retail presences elsewhere across the globe. Last year, the South Korean company was criticized for opening a location in Australia that some said appeared very similar to Apple's own store floor plans. And in 2011, a Samsung shop within a Euronics retail location in Italy was criticized for stealing Apple's own iOS application icons, including the App Store, for a wall display. However, those icons were put on display by Euronics and not by Samsung itself.